After launching our series of pub and bar crawls manageable on foot or public transport with a trio of Melbourne jaunts, we figured it was about time we took ourselves off elsewhere. So we have, hitting the streets of Sydney's Surry Hills and surrounds. Doing the hitting, sipping and sampling is Judd Owen, one half of the Brewed, Crude & Bitter blog we featured on the site not too long ago. Ask most Australians if they would like to cough up $1.5 million for a Victorian terrace house with no garage and they would quite rightfully punch you in the face. Yet that's the Surry Hills of today – an area that has come a long way since its origins two centuries ago. Walking through the streets of the inner Sydney suburb, it’s almost unfathomable to imagine that the area was once considered remote and inhospitable. The modern Surry Hills is one of the most sought after postcodes in the country, boasting more pubs, clubs and restaurants than you could poke a gentrified stick at. With its leafy streets, easy access to public transport and incredible concentration of excellent venues, Surry Hills really is a perfect spot for a Crafty Crawl. Conveniently located five minutes stroll up Devonshire Street from Central Station, Dove & Olive is the ideal venue to kick off a pub crawl. Time Out’s 2015 Pub of the Year boasts more than 20 taps and two handpumps, which staff rotate through excellent local and international beers. You can also find a few of the usual offerings from the big boys in beer, just in case you’re bringing along someone who’s yet to drink the crafty Kool Aid. If you can score a table downstairs (the upstairs balcony rooms are often reserved for functions), chances are you might find yourself staying longer than you first thought – and not just because you have lapsed into a po’boy or schnitzel food coma. After all, with a crawl like this, eating is most definitely not cheating. Make your way another half a kilometre up the hill and on to Crown Street and you’ll find probably the best vegetarian restaurant and bar in Sydney. Yulli’s knocks out a brilliant array of vegetarian food paired with five taps of their own beer plus a few guests, and offers an all NSW sourced bottle list. There’s a real sense of local pride at work here and it makes the venue that much more welcoming. 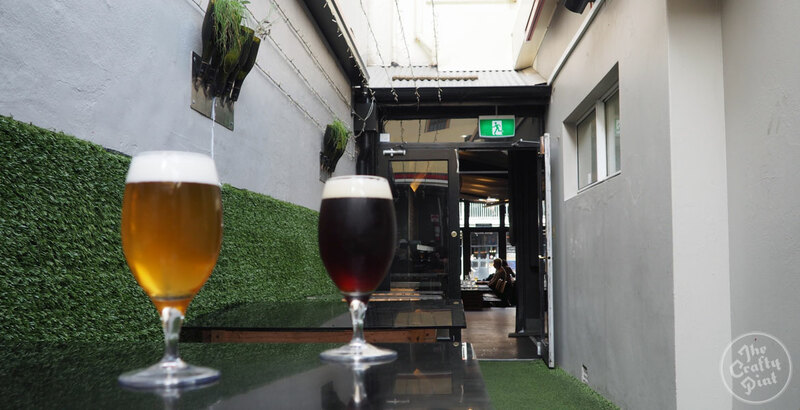 While Yulli’s is primarily a restaurant, there’s no reason why you can’t pull up stumps in the laneway out the back and spend some quality time with Norman, their Australian Ale, or Bruce Malone, the English IPA. Take your time and have a breather, you’ve got a ways to go yet. After another ten minute stroll, you'll find yourself at one of the best beer venues in the country. The Local Taphouse, Darlinghurst edition, is a place that will need no introduction most beer lovers in the country. 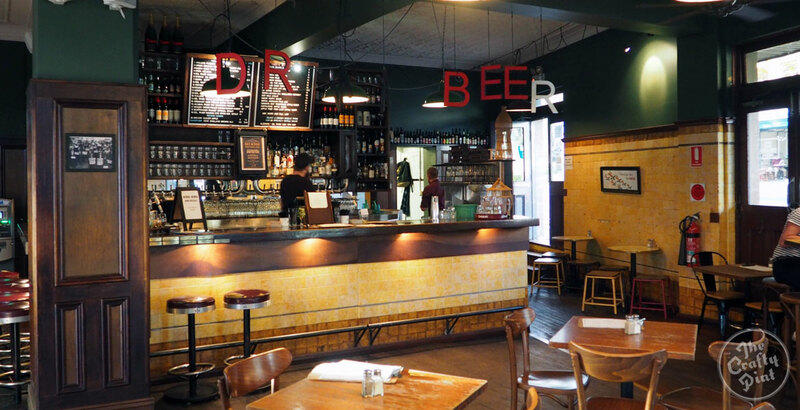 Three levels, 20 tap beers pouring at any moment in time and a long list of bottles ensures it provided one of the widest selections of excellent beer in Sydney. Depending on the timing of your visit, you might be lucky enough to arrive in the midst of – or catch the remnants of – a tap takeover or themed event featuring rarities from around Australia or further afield. Even outside such times, looking up at the letter board tap list has been known to elicit involuntary squeals from the most hardened beer fan. While the ground and first floors offer the kind of comfort that only wood panelling and leather sofas can provide, the rooftop bar on a sunny afternoon is one of the most wonderful places in Sydney. 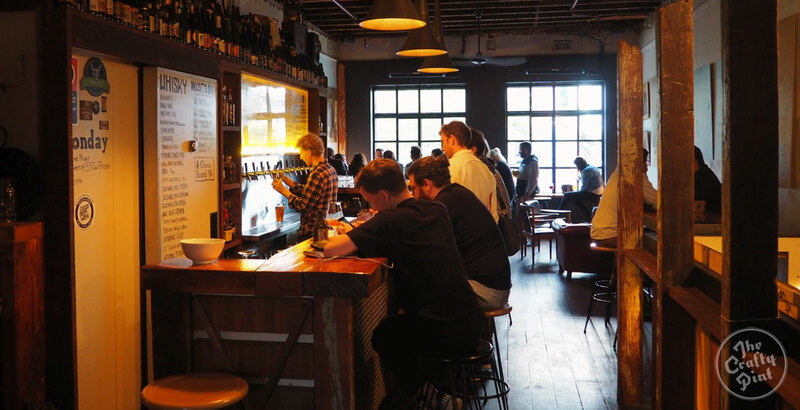 If The Local Taphouse can lay claim to being the most overtly beer focused pub in Sydney (not to mention one of the city's trailblazers), then the next stop is its quieter, smarter and more intense little brother. Bitter Phew is located in the middle of Sydney’s famous Oxford Street, up an unassuming set of stairs: a welcome that belies just how superb a venue awaits. The 12 taps at Bitter Phew may even surpass The Local Taphouse when it comes to rarities and hard to source beers from almost anywhere on Earth. On any given day, you might get a glass of Two Metre Tall Cleansing Ale from Tasmania, a Batch Brewing Co West Cost IPA that was kegged and tapped that day, then follow those with a Nøgne Ø Sour Brown Ale from Norway. This doesn’t even take into account the astonishing bottle list on offer. The staff are friendly and extremely knowledgeable so don’t be shy in asking for recommendations. 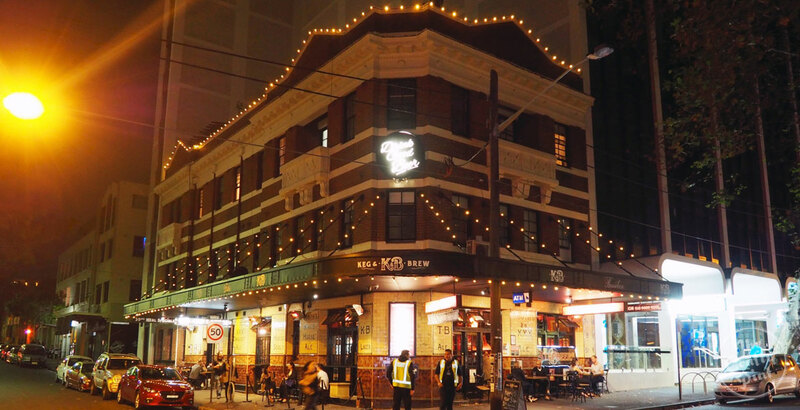 Start to make your way back towards Central Station, but don’t forget to stop at the winner of Time Out’s 2015 Best Beer List and People’s Choice, the Royal Albert Hotel. The pub's 14 taps, including two hand pumps, focus predominantly on the local stalwarts such as Modus Operandi, Young Henrys, Akasha and Wayward. However, around twice a month, the Albert will hand over all of its taps (or at least as many as a brewery can handle) in a tap takeover. The takeovers are so extensive that when Newstead Brewing from Brisbane took over the taps, there was a larger range of Newstead beers available in Surry Hills than there's ever been in their own brewpub. 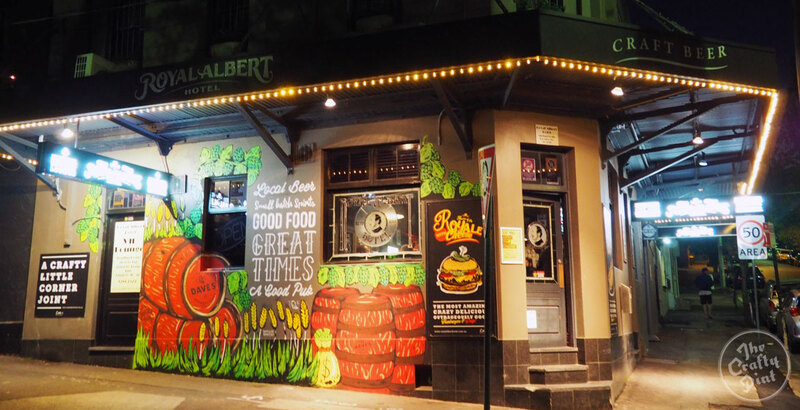 It would be criminal, five stops into a pub crawl, to neglect to mention that the Royal Albert dishes up one of the best cheeseburgers in Sydney (the Royale with Cheese), and they also have the Bamboo Dumpling Bar tucked away in the back. Fill your boots. Congratulations, friend! You’ve made it to the final stop and you’re only three schooners, two shots of bourbon, a kilogram of chicken wings and six minutes away from being whisked home on the ever reliable Sydney Trains system (subject to track works). In 2014, the same people behind the Dove & Olive (your first stop on the crawl, if you can remember back that far), turned what was a dingy, dying hotel into a busy, 33 tap beer and bourbon joint*. So, like the Dove and Olive, you’ll find a great range of local beers alongside a few from the multinationals. Here, you'll also get to pick from a range of 40-odd bourbons and whiskies if you fancy a boilermaker or something to sip on. 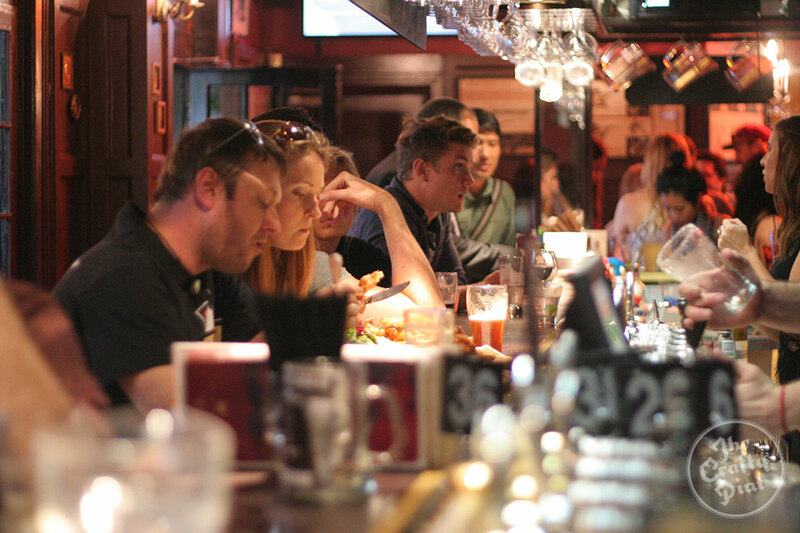 Getting a table can be difficult on busy nights but there’s usually plenty of leaning room around the bar. *The team has since added The DOG Hotel in Randwick to its roster too. You can view our other Crafty Crawls here.